Summary: Animals, foods, colors, and habitats are introduced in this book that has a repeating question and answer format: “Who eats orange? Bunnies in their hutches do. Chickens in the henhouse too. Who else eats orange? Goats. Pigs. Gorillas too? Gorillas? No! Gorillas don’t eat orange. 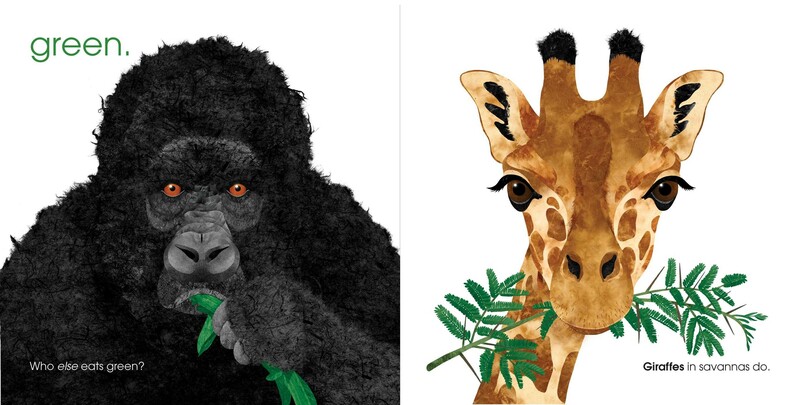 They eat…green.” The large illustrations have plenty of color on a simple white background. Humans, the book concludes, eat a rainbow of colors. The last two pages list various habitats with the animals from each listed and additional information about what and how that animal eats. 32 pages; ages 4-8. Pros: Catchy rhymes and eye-catching graphics make this an appealing introduction for a wide variety of topics. Cons: The habitats listed at the end include farms, Africa, ocean, forest, rainforest, and tundra; but Africa is a continent with many different habitats. Just an fyi – your new âKids Book A Dayâ banner/heading is coming up HUGE in my Outlook message inbox. Huge as in the N literally is 3 inches tall. Iâm not sure this has the visual impact you intended since it just requires lots of scrolling to get to the actual post content/link. That’s weird. I haven’t changed anything. It must be changes at WordPress. Sorry about that.